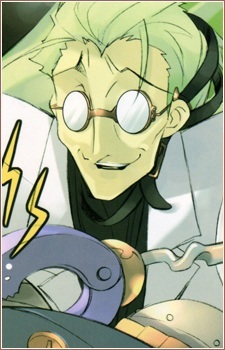 The stereotypical mad scientist, Dantalion is not liked by most Denizens, even in the Bal Masque, because he would do research on their own people. Among the Trinity, Bel Peol doesn't like him and Sydonay hates him, but somehow Hecate seems close to him, even calling him "ojii-sama" (the greeting toward grandfathers or respectable seniors) and protects him most of the time from getting into trouble with the higher-ups. Often says "-domino" at the end of his sentences.